Nestled between the vibrant Norton Commons community and parklike Wolf Pen Branch Road, this stately custom-built brick home offers a welcoming open floor plan with ample living and entertaining space throughout, including 2nd floor family room, incredible first floor master suite and updated eat-in kitchen with convenient wet bar. From the two-story great room with soaring floor-to-ceiling windows to the scenic screened-in porch with spacious grilling patio, this home is designed for time spent with family and friends. 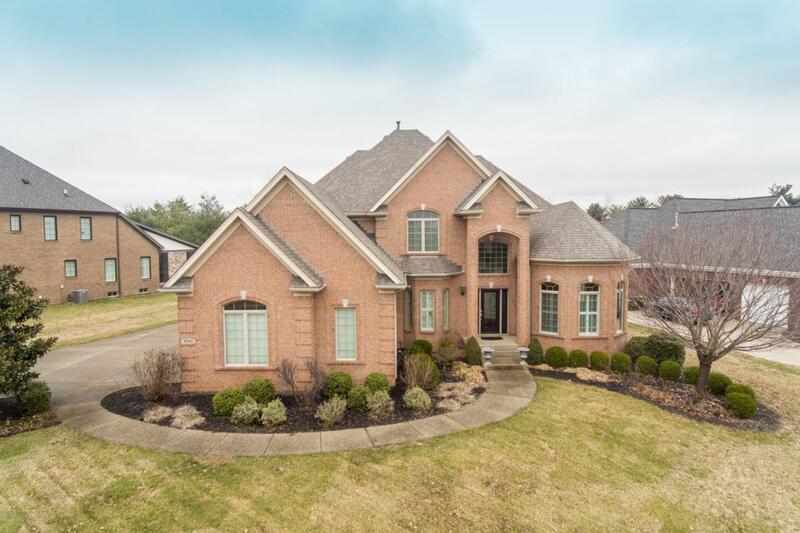 Guests enter the immaculate home through the two-story foyer featuring large arched window and elegant tile flooring before arriving into the columned formal dining with stylish wainscoting, bay window and designer ceiling medallion. The first floor continues into thegorgeous great room with sleek hardwood floors, gas fireplace and built-in bookshelves before opening into the large eat-in kitchen with columned breakfast room, floor-to-ceiling cabinetry, stainless steel appliances, wet bar with wine cooler, granite countertops and eat-in island with gas range and additional storage. The first floor master suite has been custom designed for a homeowner's private oasis, featuring spacious master bedroom with double tray ceiling, large sitting room with triple oversize windows and master bath with his-and-her vanities, soaking tub, walk-in glass shower and walk-in closet. The first floor is complete with a powder room, large laundry room and attached three-car garage. The second floor features a lofted family room with built-in desk, custom-built Murphy bed and dry bar, two spacious bedrooms and full bath with dual vanities. The unfinished lower level with garage access offers nearly 2,000 square feet to transform into additional living space, with a spacious workshop and roughed-in plumbing for a full bath already in place. Situated on a sizable lot and backing to beautiful mature trees, this home is not to be missed.